Irish Rail today announced the launch of the new service. MOTHERS-TO-BE who travel by train are being invited to get a badge telling other customers they are pregnant. The badges – available by post from Iarnród Éireann by emailing name and address to babybadges@irishrail.ie – are designed to overcome the awkwardness often felt by some pregnant women in having to ask someone to give up their seat on the train. It will also assist other customers to know a mother-to-be is pregnant as it may not be immediately obvious, and also encourage greater consideration for their needs. It’s the latest campaign from Iarnród Éireann to encourage more considerate behaviour by commuters, following the tongue-in-cheek “Urban Travel Dictionary” which highlighted the means by which some practiced commuters avoid acknowledging the needs of others for their seats. Commuting by its nature, particularly in the morning and evening peak, is busy with high demand on our services, including DART and Commuter trains. However, it should still be an environment where we all show consideration for others. Last week, Rachel Kennedy, who uses the train twice every weekday to get to and from work, told TheJournal.ie she has never been offered a seat on her Portmarnock to Pearse Station route – despite being 30-weeks pregnant. Read: ‘People see me and they just ignore me’: Is priority seating being used properly? Email “Mothers-to-be can now get baby on board badges for the train”. 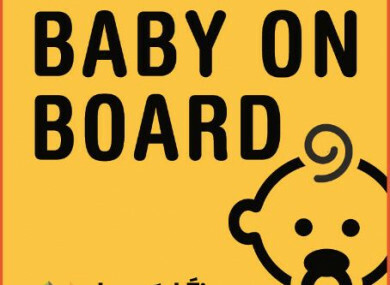 Feedback on “Mothers-to-be can now get baby on board badges for the train”.